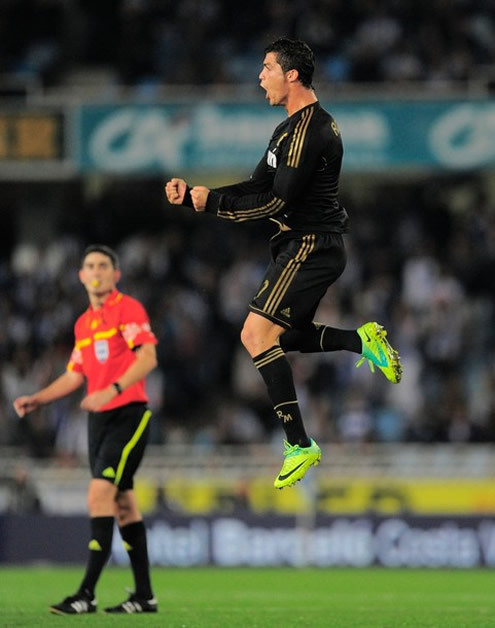 Real Madrid pulled of a valuable win in Anoeta last night, against Real Sociedad. Gonzalo Higuaín scored early in the match, as it has been usual for the Merengues over the last games. The match wasn't exciting at all, mostly due to an ultra defensive tactical approach by Real Sociedad. The Merengues brought home the 3 points, after their 6th win in a row, in La Liga. Real Madrid defeated Real Sociedad by a narrow 0-1 result and once again, José Mourinho showed his side is prepared to take any game by storm. Gonzalo Higuaín score the winning goal, after a great assist by Fábio Coentrão, who replaced Marcelo on the line-up for this game. Cristiano Ronaldo didn't have many opportunities to threaten to score, as Real Sociedad didn't grant much space to breach into their defensive fortress. Real Madrid started the game by pushing forward and seeking an early goal. As it has been happening over the last matches, the Merengues got rewarded close to the 9th minute, in a play where Fábio Coentrão showed his good vision by assisting Gonzalo Higuaín for the opener. The Argentinian found himself with just the goalkeeper in front of him and with a sublime touch, he striked the ball to the back of the net. Such an early goal, could have made Real Sociedad's coach to change his initial strategy, but the truth is that his side kept their ultra-defensive tactics for almost the entire game. As a direct result of authentically giving up of organized attacking plays in this match, Real Sociedad managed to prevent Real Madrid from creating many goalscoring chances, which necessarily lead to a bit of a boring game. The Merengues had a ball possession stat near 70%, but since there weren't much spaces to explore in Real Sociedad's back lines, Cristiano Ronaldo and his teammates couldn't create many dangerous plays throughout the game. With this result, Real Madrid reach their 6th victory in a row in the Spanish League and keep their 1 point lead advantage towards Barcelona, who also won their match against Mallorca, by 5-0. Both sides will now prepare for their scheduled fixtures in the UEFA Champions League, which will take place next Tuesday and Wednesday. Real Madrid will face Olympique Lyon in France, and another win will immediatly grant the Merengues a ticket for the last-16 stage. 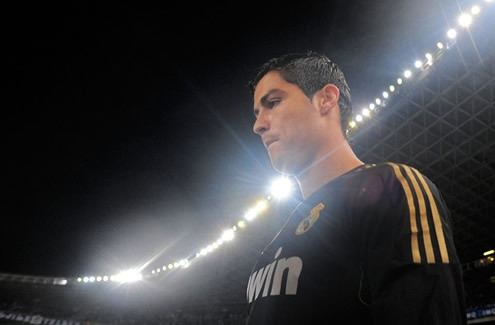 The "Blancos" are on a 8-game winning streak, when accounting all competitions (La Liga and the UEFA Champions League). Attackers: Ozil, Di María, Cristiano Ronaldo and Higuaín. Real Madrid will now play against Olympique Lyon, next Wednesday, for the UEFA Champions League. You can watch Juventus live stream, Lyon vs Real Madrid, in our Football Live Streams section. The countdown clock timer, displaying the time left for the next Ronaldo game, is shown on the top right corner of all pages. Besides that game, you can also follow the English Premier League this Sunday and watch Tottenham vs Queens Park Rangers and Viktoria Plzen vs Barcelona next Tuesday. All streamings are provided from our "Live" section.